Feb started colder than hell with Snow and Ice...Really? This is Dallas. Wow. Anyway, two weeks of circuits and then two weeks of hills. Got 50 plus miles on the bike each week - a nice surprise. Building base, Circuits and Hills. What a week! Tuesday a treacherous ice storm engulfed Dallas. Temps fluctuated between 10 and 25 for the next three days. Then it dumped six inches of snow on Friday morning - right on top of the ice. School canceled for four days. I only left the house four times - twice to run and twice to swim! 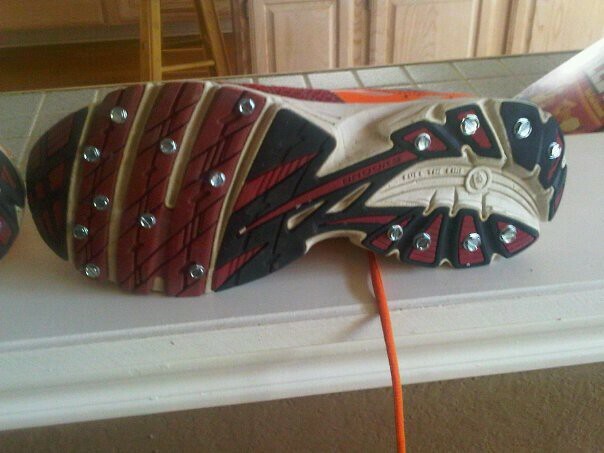 For Saturday I made a pair of ice shoes for my run! Tuesday Feb 01: LTF Garland: 500WU, 2x(300 pull, 2x150 on 2:30, 4x100 on 1:50) 500pull; 200kick. 3200 Meter Swim (168). Wednesday Feb 02: Run from Home: 77 Min (Recovery 34) 8 mile run. Sunday Feb 06: Solo ride up to mckinney (ave 16.0, CAD 79, 3:27 ride time) 55.4 Miles Bike.